Married Name 10 February 1892 As of 10 February 1892,her married name was Mulligan. Married Name 10 February 1892 As of 10 February 1892,her married name was Mullican. Married Name before 1917 As of before 1917,her married name was Cochran. Mary E. Campbell was born circa 1873 at Illinois. She was the daughter of Francis Marion Campbell and Jennette Jane Furbe. Mary E. Campbell married George M. Mullican on 10 February 1892 at first marriage for her, Adams, Illinois. Mary E. Campbell married (?) Cochran before 1917 at second marriage for her. Mary E. Campbell died on 1 March 1922 at Quincy, Adams, Illinois, The Quincy Daily Journal, Friday, March 3, 1922; page 3. The funeral of Mrs. Mary E. Mulligan was held at 2:30 o'clock Friday afternoon in the home, 1012 South Sixth street. Rev. Robert Van Meigs, pastor of the Central Baptist church, officiated. Mrs. P. Haggas and Mrs. Raymond Pettit sang. Burial was in Woodland cemetery. She was buried after 1 March 1922 at Woodland Cemetery, Adams, Illinois. Mary E. Campbell had zero children. 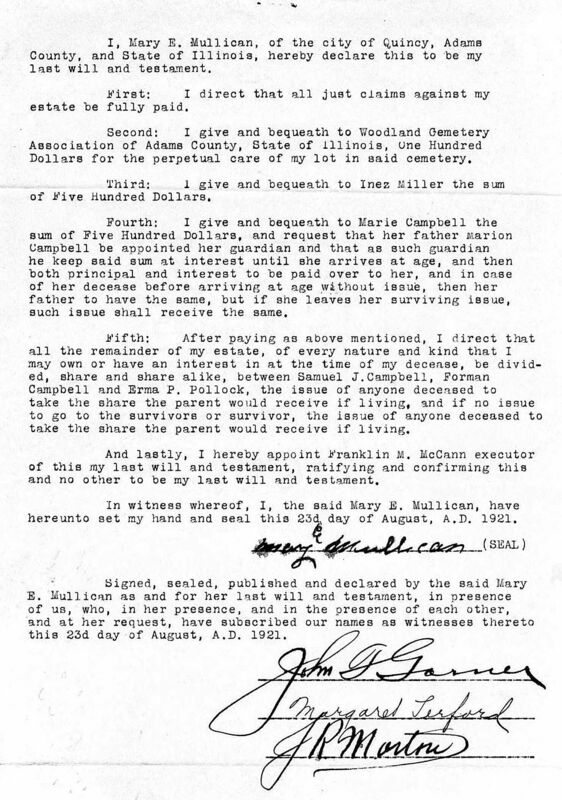 In Jennette Jane Furbe's will dated 3 October 1900, Mary E. Campbell was named as an heir. She had zero children. She left a will on 23 August 1921. [S246] U.S. Federal Census 1880 U.S. Federal Census, by Ancestry.com, NA Film Number T9-0174 Page Number 340B. [S245] U.S. Federal Census 1900 U.S. Federal Census, by Ancestry.com, Year: 1900; Census Place: Clayton, Adams, Illinois; Roll T623_ 235; Page: 1B; Enumeration District: 103. [S244] U.S. Federal Census 1910 U.S. Federal Census, by Ancestry.com, Year: 1910; Census Place: Quincy Ward 2, Adams, Illinois; Roll T624_229; Page: 3A; Enumeration District: 37; Image: 843. [S243] U.S. Federal Census 1920 U.S. Federal Census, by Ancestry.com, Year: 1920; Census Place: Quincy Ward 3, Adams, Illinois; Roll: T625_296; Page: 8B; Enumeration District: 40; Image: 858. Name Variation Lillian May Campbell was also known as Lillie May. Name Variation Lillian May Campbell was also known as Lilly. Married Name circa 1924 As of circa 1924,her married name was Wolf. Lillian May Campbell was born in January 1876 at Ursa, Adams, Illinois. As of 1920, Lillian May Campbell was never married. She married Chris Herman Wolf, son of Godfrey Wolf and Dora Gette, circa 1924. Lillian May Campbell died on 10 November 1961 at Illinois at age 85. She was buried on 14 November 1961 at Greenmount Cemetery, Quincy, Adams, Illinois. 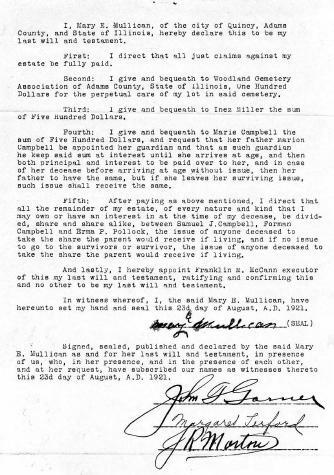 In Jennette Jane Furbe's will dated 3 October 1900, Lillian May Campbell was named as an heir. She was a hotel chamber maid in 1910. [S245] U.S. Federal Census 1900 U.S. Federal Census, by Ancestry.com, ED145. Stamp 318A. [S244] U.S. Federal Census 1910 U.S. Federal Census, by Ancestry.com, ED48. Dwelling 237. [S243] U.S. Federal Census 1920 U.S. Federal Census, by Ancestry.com, ED36. Dwelling 71. [S250] U.S. Federal Census 1930 U.S. Federal Census, by Ancestry.com, Year: 1930; Census Place: Quincy, Adams, Illinois; Roll 406; Page: 9B; Enumeration District: 56; Image: 200.0. [S373] U.S. Federal Census 1940 U.S. Federal Census, by Ancestry.com, Year: 1940; Census Place: Quincy, Adams, Illinois; Roll: T627_756; Page: 4B; Enumeration District: 1-40. Name Variation Rosa E. Darnell was also known as Rosie. Married Name 24 September 1890 As of 24 September 1890,her married name was Campbell. Rosa E. Darnell was born in January 1872 at Illinois also reported as 1873. She was the daughter of James A. Darnell and Louisa (?). Rosa E. Darnell died on 11 June 1947 at age 75. She was buried on 13 June 1947 at Greenmount Cemetery, Quincy, Adams, Illinois. Rosa E. Darnell had 3 with 2 living in 1910 children. [S186] Illinois, Illinois Statewide Marriage Index, license 00006865. [S246] U.S. Federal Census 1880 U.S. Federal Census, by Ancestry.com, Year: 1880; Census Place: Winthrop, Buchanan, Missouri; Roll: T9_676; Family History Film: 1254676; Page: 516.3000; Enumeration District: 81; Image: 0575. [S244] U.S. Federal Census 1910 U.S. Federal Census, by Ancestry.com, ED9. Dwelling 124. [S243] U.S. Federal Census 1920 U.S. Federal Census, by Ancestry.com, ED35. Sheet 8B. [S250] U.S. Federal Census 1930 U.S. Federal Census, by Ancestry.com. Gilbert Arthur Rosenthal was born on 19 October 1915. He was the son of George F. Rosenthal and Elizabeth M. Wollschlager. Gilbert Arthur Rosenthal married Lucile J. Haessler, daughter of Otto Victor Haessler and Louisa M. Dangel, on 12 April 1941. Gilbert Arthur Rosenthal died on 14 February 1990 at Madison, Dane, Wisconsin, at age 74 Gilbert A Rosenthal obituary. Gilbert Arthur Rosenthal obtained US Social Security Card at Wisconsin; last residence not specified. 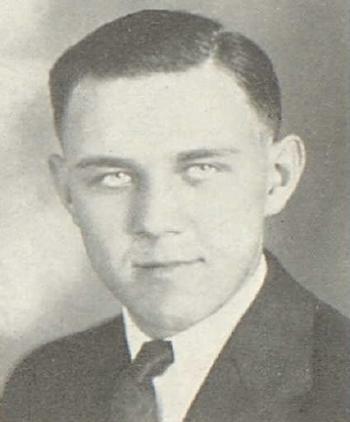 He graduated in 1933 at Reedsburg High School, Reedsburg, Sauk, Wisconsin. Married Name Her married name was Gregory. Name Variation Rosella P. Rosenthal was also known as Rosellen. Rosella P. Rosenthal married James G. Gregory, son of James Gregory and Jennie Faivre. Rosella P. Rosenthal was born in 1912. She was the daughter of William Rosenthal and Gladys Knowles. Rosella P. Rosenthal died on 21 February 1964. Rosella P. Rosenthal graduated in 1929 at Reedsburg High School, Reedsburg, Sauk, Wisconsin. Married Name 17 August 1941 As of 17 August 1941,her married name was Peterson. Gertrude Rosetta Rosenthal was born on 17 December 1916 at Wisconsin. She was the daughter of Edward Rosenthal and Frieda P. Huebing. Gertrude Rosetta Rosenthal married William Peterson on 17 August 1941 at California. Gertrude Rosetta Rosenthal died on 8 March 2012 at age 95 Gertrude Rosetta Rosenthal Peterson, age 95, of Madison (formerly, Monona), passed away on Thursday, March 8, 2012, in Madison. She was born on Dec. 17, 1916, in Reedsburg, the daughter of Edward and Frieda (Huebing) Rosenthal. Gertrude graduated from Reedsburg High School, and attended La Crosse Business University. She married William Peterson on Aug. 17, 1941, in Los Angeles, Calif. Gertrude was an administrative secretary for the State of Wisconsin. She was a member of the Monona Lutheran Church. Gertrude is survived by her son, William E. (Susan) Peterson; daughter, Joyce M. (Delton) Thorson; five grandchildren; four great-grandchildren; sister-in-law, Pauline Bredeson; and brother-in-law, Phillip Peterson. She was preceded in death by her husband in 1998; and granddaughter, Tammy Cregut. Funeral services will be held at OAKWOOD TREE OF LIFE CHAPEL, 5565 Tancho Drive, Madison, at 11 a.m., on Monday, March 12, 2012, with the Rev. William Pekari presiding. Burial will be at St. Peter's Lutheran Cemetery at 2:30 p.m. in Reedsburg. Visitation will be held at GUNDERSON EAST FUNERAL HOME, 5203 Monona Drive, Madison, from 4 p.m. until 6 p.m. on Sunday, March 11, 2012. Memorials may be made to the Oakwood Foundation or Monona Lutheran Church. 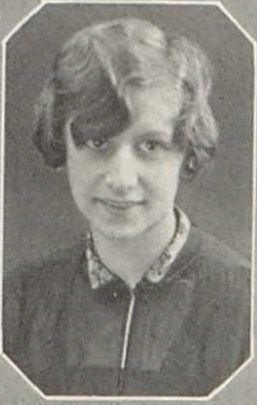 Gertrude Rosetta Rosenthal graduated in 1934 at Reedsburg High School, Reedsburg, Sauk, Wisconsin. Hannah Collies was the daughter of August Ferdinand Collies and Pauline Reiker. Name Variation Lucile J. Haessler was also known as Hessler. Name Variation Lucile J. Haessler was also known as Lucille. Married Name 12 April 1941 As of 12 April 1941,her married name was Rosenthal. Lucile J. Haessler was born on 5 May 1919 at Wisconsin. She was the daughter of Otto Victor Haessler and Louisa M. Dangel. Lucile J. Haessler married Gilbert Arthur Rosenthal, son of George F. Rosenthal and Elizabeth M. Wollschlager, on 12 April 1941. Lucile J. Haessler died on 3 December 2011 at age 92 Lucile J. Rosenthal, age 92, of Reedsburg, died on Saturday, December 3, 2011 in the Zimmerman Nursing Home. She was born on May 5, 1919 in Reedsburg, the daughter of Otto and Louise (Dangel) Haessler. On April 12, 1941, she was married to Gilbert A. Rosenthal. Lucile was a faithful member of St. Peter's Lutheran Church. She enjoyed playing cards especially canasta, keeping up on current events, attending all of her granddaughter's activities and going out to eat especially for a Friday night fish fry . Survivors include her granddaughter: Krista (Jay) Sitek, of Appleton; her half-sister: Linda (Richard) Lalor, of Verona; a special niece: Janet (David) Primus, of Madison; other relatives and friends. She was preceded in death by her husband: Gilbert, on February 14, 1990; her daughter: Sharon Braun; her son-in-law: Dennis Braun and her sister: Lorraine Haessler. Funeral services will be conducted at 10:30 A.M. on Thursday, December 8, 2011 at St. Peter's Ev. Lutheran Church in Reedsburg with Pastor Paul Crolius officiating. Interment will be in St. Peter's Lutheran Cemetery. There will be a visitation from 9:00 A.M. until the time of the service on Thursday at the church. In lieu of flowers, memorials to the Zimmerman Nursing Home would be appreciated. The Hoof Funeral Home is serving the family. Lucile J. Haessler graduated in 1937 at Reedsburg High School, Reedsburg, Sauk, Wisconsin. [S243] U.S. Federal Census 1920 U.S. Federal Census, by Ancestry.com, ED175. Dwelling 339. Married Name Her married name was Braun. Sharon Rosenthal married Dennis Braun, son of Verlyn E. Braun and Violet C. Zimmerman. Sharon Rosenthal was born on 24 September 1946 at Reedsburg, Sauk, Wisconsin. She was the daughter of Gilbert Arthur Rosenthal and Lucile J. Haessler. Sharon Rosenthal died on 24 July 2003 at Reedsburg, Sauk, Wisconsin, at age 56 Sharon L. Braun, age 56, of Reedsburg, died on Thursday morning, July 24, 2003, in the Reedsburg Area Medical Center following a courageous battle with cancer. 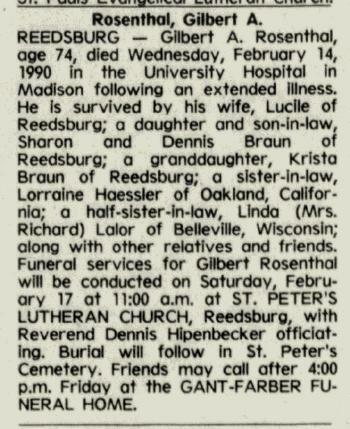 She was born Sept. 24, 1946, in Reedsburg, the daughter of Gilbert and Lucile (Haessler) Rosenthal. She was preceded in death by her father, Gilbert Rosenthal; and her mother-in-law, Violet Braun. Name Variation Otto Victor Haessler was also known as Hessler. Otto Victor Haessler married Louisa M. Dangel, daughter of Gustav Dangel and Doris L. Mueller. Otto Victor Haessler was born on 14 March 1894 at Nebraska. On 31 May 1917 at World War I Draft Registration, Sauk, Wisconsin, reported as married with 1 child. Name Variation Louisa M. Dangel was also known as Louise. Name Variation Louisa M. Dangel was also known as Laura. Married Name Her married name was Haessler. Louisa M. Dangel married Otto Victor Haessler. Louisa M. Dangel was born on 19 April 1896 at Wisconsin. She was the daughter of Gustav Dangel and Doris L. Mueller. Louisa M. Dangel died on 7 September 1970 at age 74. [S245] U.S. Federal Census 1900 U.S. Federal Census, by Ancestry.com, Year: 1900; Census Place: Reedsburg, Sauk, Wisconsin; Roll T623_1816; Page: 2A; Enumeration District: 142. [S244] U.S. Federal Census 1910 U.S. Federal Census, by Ancestry.com, Year: 1910; Census Place: Reedsburg Ward 2, Sauk, Wisconsin; Roll T624_1736; Page: 3B; Enumeration District: 124; Image: 1140. Lorraine Evelyn Haessler was born on 12 June 1916 at Wisconsin. Lorraine Evelyn Haessler died on 10 February 2008 at California at age 91. 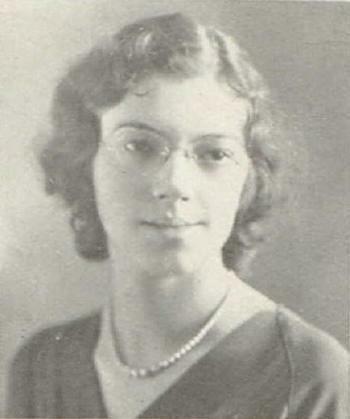 Lorraine Evelyn Haessler graduated in 1933 at Reedsburg High School, Reedsburg, Sauk, Wisconsin. Name Variation Phoebe Miller was also known as Phebe. Married Name 8 August 1796 As of 8 August 1796,her married name was Daniels. Phoebe Miller was born on 28 April 1781 at Vermont. She was the daughter of Aaron Miller and Ruth Ingalls. Phoebe Miller married John Daniels Sr., son of John Daniels, on 8 August 1796. Phoebe Miller died on 20 November 1863 at age 82. She was buried after 20 November 1863 at Howard Union Cemetery, near Pecatonica, Winnebago, Illinois. Children of Phoebe Miller and John Daniels Sr.
[S249] U.S. Federal Census 1850 U.S. Federal Census, by Ancestry.com, Year: 1850; Census Place: Rock Run, Stephenson, Illinois; Roll: M432_129; Page: 367B; Image: 351. [S248] U.S. Federal Census 1860 U.S. Federal Census, by Ancestry.com, Year: 1860; Census Place: Rock Run, Stephenson, Illinois; Roll: M653_230; Page: 353; Image: 353; Family History Library Film: 803230. John Daniels Sr. was the son of John Daniels. John Daniels Sr. married Phoebe Miller, daughter of Aaron Miller and Ruth Ingalls, on 8 August 1796. John Daniels Sr. died in 1855. Married Name Her married name was Paul. Wealthy Daniels was the daughter of John Daniels Sr. and Phoebe Miller. Wealthy Daniels married David Paul. Wealthy Daniels died in 1884. In re Wealthy Paul, late of West Bloomfield, deceased. David A. Pierpont, executor. Weathly Daniels Paull died in 1884. David Paul was buried at Evergreen Baptist Cemetery, West Bloomfield, New York. He married Wealthy Daniels, daughter of John Daniels Sr. and Phoebe Miller. Married Name Her married name was Farwell. Mahala Daniels married Isaac Farwell, son of Isaac Farwell and Prudence Allen. Mahala Daniels was born in 1801 at West Rutland, Vermont. She was the daughter of John Daniels Sr. and Phoebe Miller. Mahala Daniels died in 1874 Mahala died in 1874 and is buried in the Arena Cem. Husband, Isaac Farwell died in 1883, perhaps, in California, as he was living there in 1880. He is also buried in the Arena Cem; as is Mahala's brother, Nelson Daniels, who died in 1896. Isaac Farwell and Mahala Daniels lived in Stepheson Co IL and moved at the same time as Mahala's brother Nelson to Arena Iowa Co Wisconsin. Isaac Farwell married Mahala Daniels, daughter of John Daniels Sr. and Phoebe Miller. Isaac Farwell was born in 1804 at Charleston, Sullivan, New Hampshire. He was the son of Isaac Farwell and Prudence Allen. Isaac Farwell died in 1883 buried in the Arena Cemetery. Married Name 6 April 1825 As of 6 April 1825,her married name was Paul. Ruth M. Daniels was born in 1807. Ruth M. Daniels married Zebedee Paul on 6 April 1825 at Ontario, New York. Zebedee Paul married Ruth M. Daniels, daughter of John Daniels Sr. and Phoebe Miller, on 6 April 1825 at Ontario, New York. John Daniels Jr. was born in June 1820 at New York. He was the son of John Daniels Sr. and Phoebe Miller. John Daniels Jr. married Candace Sarah Emery, daughter of Dr. George Ried Emery and Candace Merrills Willey, before 1846. John Daniels Jr. was buried in December 1857 at Howard Union Cemetery, near Pecatonica, Winnebago, Illinois. He died in December 1857 at from tuberculosis at age 37. Married Name before 1846 As of before 1846,her married name was Daniels. Married Name 29 August 1867 As of 29 August 1867,her married name was Tunks. Candace Sarah Emery was born on 28 September 1825 at Thompson, Geauga, Ohio, also reported as Pennsylvania. She was the daughter of Dr. George Ried Emery and Candace Merrills Willey. Candace Sarah Emery married John Daniels Jr., son of John Daniels Sr. and Phoebe Miller, before 1846. Candace Sarah Emery married William Z. Tunks on 29 August 1867 at her second husband, Stephenson, Illinois. Candace Sarah Emery died on 6 March 1922 at at the home of her son, Henry Brown Daniels, Elwood, Gosper, Nebraska, at age 96 also reported as 08 Mar 1922. Children of Candace Sarah Emery and John Daniels Jr.
[S247] U.S. Federal Census 1870 U.S. Federal Census, by Ancestry.com, Year: 1870; Census Place: Rock Run, Stephenson, Illinois; Roll M593_275; Page: 309B; Image: 623; Family History Library Film: 545774. [S244] U.S. Federal Census 1910 U.S. Federal Census, by Ancestry.com, Year: 1910; Census Place: Addison, Addison, Vermont; Roll: T624_1612; Page: 9B; Enumeration District: 0001; Image: 24; FHL Number: 1375625. [S243] U.S. Federal Census 1920 U.S. Federal Census, by Ancestry.com, Year: 1920;Census Place: Elwood, Gosper, Nebraska; Roll: T625_983; Page: 1A; Enumeration District: 92; Image: 1054. William Z. Tunks was born on 9 March 1817 at Clarke, Ohio. He married Armadilla Mcintire before 1853. William Z. Tunks married Candace Sarah Emery, daughter of Dr. George Ried Emery and Candace Merrills Willey, on 29 August 1867 at her second husband, Stephenson, Illinois. William Z. Tunks died on 30 July 1888 at Davis, Illinois, at age 71. After 1864 William helped arranged guardianship of Candace' minor children and arranged to sue the Fosslers for return of $200 John Daniels Jr had loaned them. Name Variation William Christian Zick was also known as Willie C.
William Christian Zick was born in September 1869 at Wisconsin also reported as Nov 1870. He was the son of Herman Wilhelm Zick Sr. and Henrietta Louisa Zerbel. William Christian Zick married Ida Augusta Klipstein circa 1898. William Christian Zick was listed as a beneficiary in Herman Wilhelm Zick Sr.'s will on 1 June 1908 at Sauk, Wisconsin. William Christian Zick died in 1942. [S247] U.S. Federal Census 1870 U.S. Federal Census, by Ancestry.com, Year: 1870; Census Place: Honey Creek, Sauk, Wisconsin; Roll: M593_1739; Page: 118A; Image: 241; Family History Library Film: 553238. [S246] U.S. Federal Census 1880 U.S. Federal Census, by Ancestry.com, NA Film Number T9-1446 Page Number 132A. [S245] U.S. Federal Census 1900 U.S. Federal Census, by Ancestry.com, ED137. Dwelling 119. [S364] Wisconsin State Census Wisconsin State Censuses, 1895 and 1905, by Ancestry.com, Dwelling 156. [S244] U.S. Federal Census 1910 U.S. Federal Census, by Ancestry.com, Year: 1910; Census Place: Honey Creek, Sauk, Wisconsin; Roll: T624_1736; Page: 2B; Enumeration District: 0118; Image: 968; FHL Number: 1375749. [S243] U.S. Federal Census 1920 U.S. Federal Census, by Ancestry.com, ED167. Dwelling 34. Married Name circa 1898 As of circa 1898,her married name was Zick. Ida Augusta Klipstein was born in February 1878 at Wisconsin. She married William Christian Zick, son of Herman Wilhelm Zick Sr. and Henrietta Louisa Zerbel, circa 1898. Ida Augusta Klipstein died in 1949. Ida Augusta Klipstein had 2 with 2 living in 1910 children. Name Variation William Henry Nieman was also known as W. H.
Name Variation William Henry Nieman was also known as Henry William. Name Variation William Henry Nieman was also known as Niemann. William Henry Nieman was born on 10 September 1869 at Wisconsin. He was the son of Henry August Niemann and Dorothea T. Meyer. William Henry Nieman married Edith Ella Goodner, daughter of William D. Goodner and Edith J. Griswold, on 9 September 1896. William Henry Nieman died on 3 January 1928 at Randolph, Iowa, at age 58. 1895 Harlan, Shelby, Iowa William Henry Nieman appeared on the census of 1895 in the household of Henry August Niemann at Harlan, Shelby, Iowa. 1 June 1905 Harlan, Shelby, Iowa He appeared on the census of 1 June 1905 at Harlan, Shelby, Iowa. 1 January 1925 Riverside, Fremont, Iowa He appeared on the census of 1 January 1925 at Riverside, Fremont, Iowa. [S247] U.S. Federal Census 1870 U.S. Federal Census, by Ancestry.com, Year: 1870; Census Place: Madison Ward 3, Dane, Wisconsin; Roll: M593_1708; Page: 332B; Image: 669; Family History Library Film: 553207. [S246] U.S. Federal Census 1880 U.S. Federal Census, by Ancestry.com, Year: 1880; Census Place: Douglas, Shelby, Iowa; Roll: 364; Family History Film: 1254364; Page: 133A; Enumeration District: 211; Image: 0515. [S245] U.S. Federal Census 1900 U.S. Federal Census, by Ancestry.com, Year: 1900; Census Place: Harlan, Shelby, Iowa; Roll: T623_459; Page: 7B; Enumeration District: 165. [S244] U.S. Federal Census 1910 U.S. Federal Census, by Ancestry.com, Year: 1910; Census Place: Harlan, Shelby, Iowa; Roll: T624_423; Page: 8B; Enumeration District: 0170; Image: 608; FHL Number: 1374436. [S243] U.S. Federal Census 1920 U.S. Federal Census, by Ancestry.com, Year: 1920;Census Place: Riverside, Fremont, Iowa; Roll: T625_490; Page: 12A; Enumeration District: 74; Image: 983. Philip Thieding married Esther A. Stolte, daughter of Carl Stolte and Anna Schlieckau, at first marriage for him. Philip Thieding was born in 1905. He was the son of Carl H. Thieding and Anna G. Schroeder. Philip Thieding married Dorothy (?) after 1976. Philip Thieding died in 1979. Married Name 29 September 1951 As of 29 September 1951,her married name was Stolte. Sylvia C. Brunkow was born on 20 March 1931. 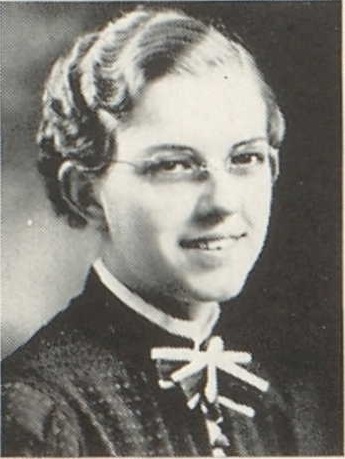 She was the daughter of Herbert Brunkow and Frances Larson. Sylvia C. Brunkow married Ervin C. Stolte, son of Carl Stolte and Anna Schlieckau, on 29 September 1951. Sylvia C. Brunkow died on 15 November 2013 at age 82 Sylvia C. Stolte, age 82, of Loganville, died Friday morning, November 15, 2013 at University Hospital in Madison. She was born on March 20, 1931 in Pepin, the daughter of Herbert and Frances (Larson) Brunkow. On September 29, 1951 she was united in marriage to Ervin C. Stolte. Sylvia was a loving mother, grandmother and great grandmother. She was a member of St. Peter's Lutheran Church and was active with the church ladies and the quilting group and was active in homemakers for many years. Sylvia enjoyed spending time with her grandchildren, sewing as well as feeding and watching the birds. Survivors include three sons: Carl Stolte, of Middleton; Daniel (Shari) Stolte, of Loganville and Steven Stolte, of Reedsburg; ten grandchildren; three great grandchildren; her brother: Fred Brunkow, of Pepin; nieces and nephews; other relatives and friends. She was preceded in death by her husband, Ervin, on November 16, 2006; an infant son and a great grandson: Dylan Stolte. Funeral services will be conducted at 11:00 A.M. on Wednesday, November 20, 2013 at St. Peter's Lutheran Church in Loganville with Pastor Christopher Miller officiating. Interment will be in St. Peter's Cemetery. The family will receive friends from 4:00 P.M. to 6:00 P.M. on Tuesday at the Hoof Funeral Home in Reedsburg. The Hoof Funeral Home is serving the family. (?) Stolte died in 1953. He was born in 1953. He was the son of Ervin C. Stolte and Sylvia C. Brunkow. Married Name Her married name was Stolte. Name Variation Paulina E. Klagos was also known as Pauline. Name Variation Paulina E. Klagos was also known as Paula. Paulina E. Klagos married John Stolte Jr., son of John Stolte and Marie Huedeng. Paulina E. Klagos was born in January 1893 at Wisconsin. She was the daughter of Herman Klagos and Emma Sanders. Paulina E. Klagos died on 4 November 1970 at Reedsburg, Sauk, Wisconsin, at age 77. Children of Paulina E. Klagos and John Stolte Jr.